These photographs explore the life of radio collector David Kraeuter. I first began working on this series in 2004 as a black and white narrative-style 'silent film' in Super 8mm format. In 2005 I made a study of Kraeuter and his radios as a video documentary and slideshow. Even though I'm not a collector of radios myself, I continue to be interested in the aesthetics of old-time radios. In the present series I interpret David Kraeuter and his interactions with vacuum tube technology through still life and portrait photography. While the images in this series are not always literal, much less documentary, they do have a poetic style that expresses Kraeuter's life as a collector and his passion for this disappearing technology. Precision Tube Tester Series 910. 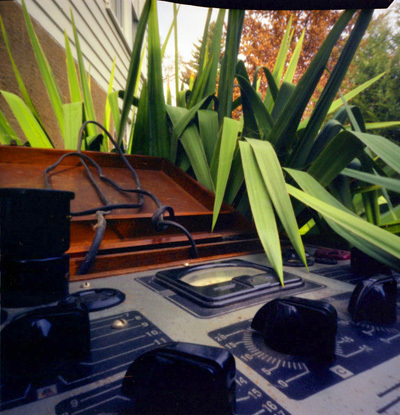 2006, Scanned color pinhole negative. David Kraeuter Series. © 2005 by Allen C. Benson.